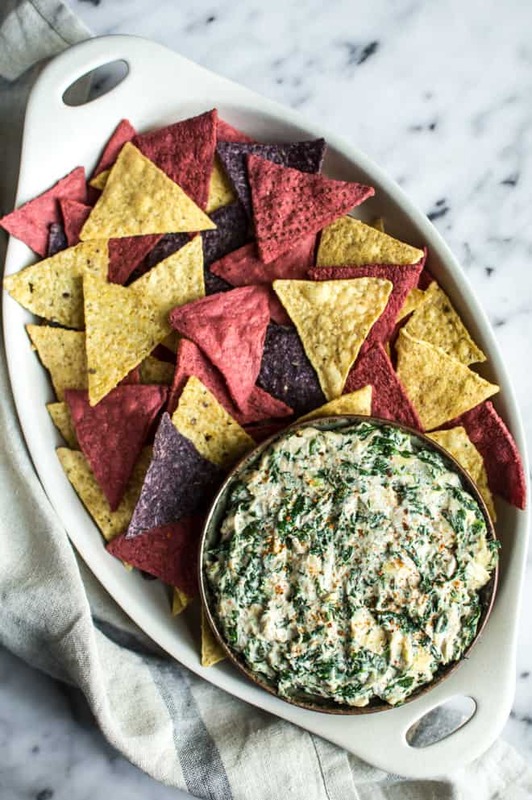 This spicy vegan spinach artichoke dip comes together with just 9 ingredients. The dip gets its creaminess from cashew cream. Do you serve appetizers before the Thanksgiving dinner, or do you forgo the small bites to leave room before the big feast? In my family, there’s no such thing as “saving room” for dinner. We just eat all the time. That’s why the appetizers are just as important as the main event. For whatever reason, one of my sisters has brought a cheesy spinach artichoke dip to our last few family gatherings. It tastes quite good, but it’s so rich that 1/4 of that dip is a meal unto itself. 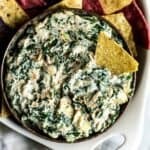 I want to keep the spinach artichoke dip tradition alive during my Thanksgiving dinner this year with a dip of my own. I made a lighter version by leaving out on the cheese and sour cream and mixing in some cashew cream instead. From tikka masala to cheesecakes, we’ve seen how cashew cream can be so versatile in the kitchen. It’s absolutely dreamy in this dip. It adds a richness and natural sweetness that pairs so well with the vegetables. I’ve been snacking on the dip over the last few days and spreading it on my morning toast with a heavy hand. It’s wonderfully addictive. With Thanksgiving coming up in less than a week, how far along are you with your planning? I have 3 dishes down, but still have to tackle the dessert and figure out what I’m doing with the bird. Stay tuned to see what dessert I make! Get that Water Out! Make sure to squeeze the excess water from the spinach before chopping and mixing it with the rest of the ingredients. Heating the Dip: I like the serving the dip as is, but if you want it warmed, pop the dip in a 350 degrees F oven (175 degrees C) for about 10 minutes. Word of warning, the dip will turn a bit yellow once you bake it, but it still tastes fine! Try with homemade baked tortilla chips! This dip is great with homemade tortilla chips, too. Click here for the printable recipe, or check out my video tutorial! High-speed blender: To get the dip extra creamy, I like to use a high-speed blender. Alternatively, you can use a food processor or an immersion blender. LOOKING FOR MORE VEGAN DIPS? Soak cashews with water overnight or with boiling water for 1 hour. Heat a large sauté pan with the olive oil over medium heat. When the pan is hot, add the minced garlic and let it cook for a minute. (Watch the garlic dance!) Add spinach and cook until wilted, about 2 to 3 minutes. Remove from heat. 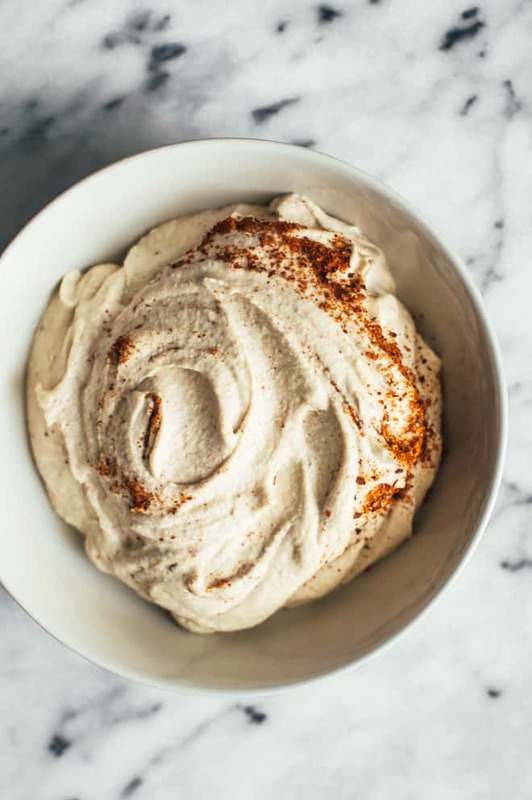 In a high-speed blender or food processor, mix the cashews, soy milk, salt, cayenne pepper, and lime juice together until you get a creamy sauce. Taste the sauce and adjust seasonings to your liking. Set aside. When the spinach is cool enough to handle, squeeze out excess liquid from spinach. Give the spinach a rough chop. In a medium bowl, mix the spinach, chopped artichokes, and creamy cashew sauce together. Serve dip with chips, crackers, or your favorite vegetables! To make the turkey (as seen in the photos), cut 2 slices of cucumbers and 2 slices of olives for the eyes. For the nose, cut a baby carrot in half, crosswise. Take one half of the carrot and make 2 diagonal cuts to create a large triangle shape. For the feet, cut a carrot in half, lengthwise. Make small diagonal cuts on one end of the carrots to make the feet. For the wattle, slice a thin strip of red pepper. I haven’t really caught on to the cashew milk thing, though I’ve been tempted to pick up a carton at the supermarket. Milk and matcha go so well together! Hope your Thanksgiving dinner planning is coming along well! We do fewer apps these days at family gatherings. That said, I would consider this dip a ameal on its own. I am not familiar with pilpelchuma but I will try to find it here in Chicago. Looks beautiful! Thanks, Melissa! I picked up the pilpelchuma from Trader Joe’s! You can also use whatever spice blend you like, too! That dip is so cute! My kids would go crazy over that. 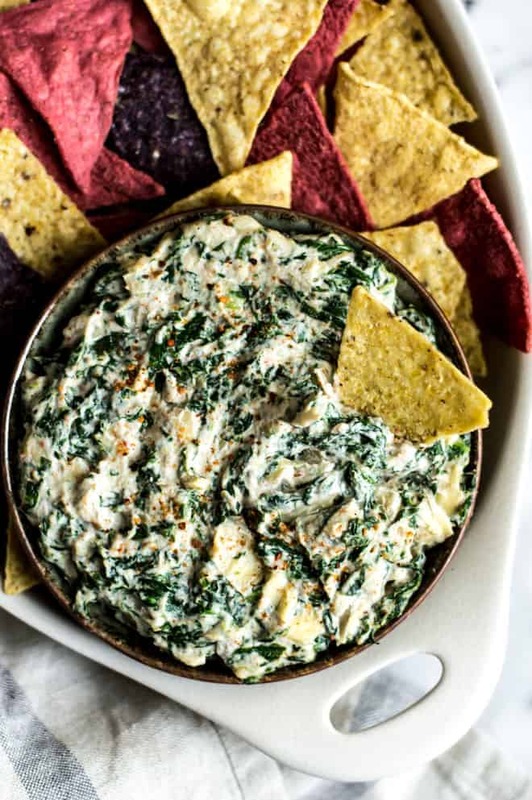 I have always loved spinach and artichoke dip, especially at Thanksgiving. I love that you spiced it up. So fun! You are so creative. 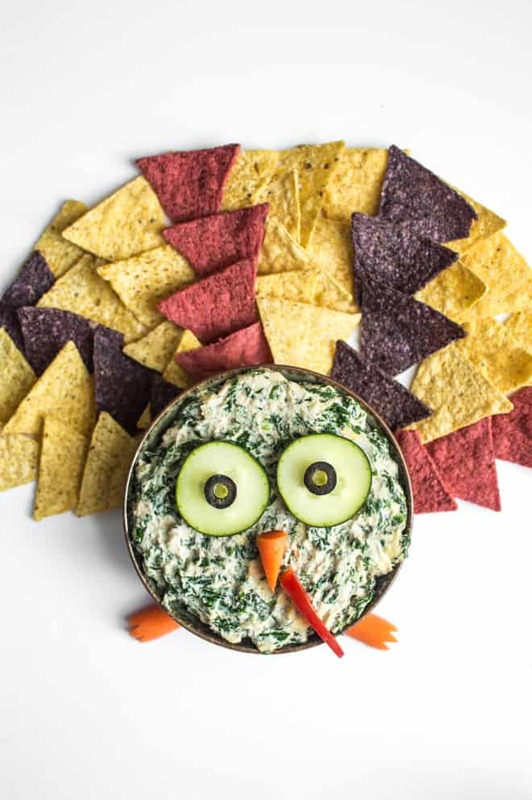 I love that this dip not only looks like it tastes incredible but it is a fun idea for Thanksgiving too! This is on delicious looking dip! My brother is vegan so I’m always looking for a fun holiday recipe to make for him. Thanks, Brandy!! Cashew cream works wonders to make dips creamy! Thanks, Sarah!! Yea, that cashew cream works wonders! Hi, Heidi! Thank you so much for pointing out the typo! Yes, it is supposed to be 1 teaspoon of kosher salt. I have updated the recipe accordingly. Can you find a cajun spice blend where you are? That would work wonderfully here, too! There’s no serving size for this. Does it serve 6? 12? I’m making it for a baby shower this weekend and need to know if 8 should double or triple the recipe for a crowd. Hi Elaina, this dip should serve about 6 to 8 people. Can you adjust the nutrition information to be per serving (6 or 8) vs. 1/12 of the recipe? The recipe was easy to follow, and the results were AMAZING! The household LOVED it! Thank you. Dee, thank you so much for trying the recipe and for letting me know how it turned out! Glad your family liked it! Will this work well if I bake it in a bread bowl? Hi, Keriann! Honestly, I haven’t tried baking it in a bread bowl before, but I don’t see why it wouldn’t work. If you try baking it in a bread bowl, please let me know how it turns out! Hi- I baked it in fillo dough yesterday, turned out great! Shannon, thank you so much for trying out the recipe!! I’m so glad that you and your family enjoyed it! Reading this comment made my day. Hope you have a great week, and happy new year! I’m hoping to make this for my birthday party, unfortunately, my best friend was deathly allergic to cashews and steers clears of them to this day (even though it’s been 5 years since she was no longer allergic to nuts). Do you know if I could use a different nut that would put her mind at ease? Thanks for your question, Shaylea. I haven’t tried this with other nuts. The only things I could think of trying are sunflower seeds and almonds with the brown skins removed, like blanched almonds. If your friend is okay with eating dairy, you can also use a mixture of sour cream and greek yogurt. Hope this helps! I honestly never comment on recipe blogs but this dip is SO good! I just had to comment. Made it for a holiday party for a group that included two lactose intolerants and two vegans and EVERYONE loved it! So addictive. Make this. Erin, thank you so much for trying the recipe!! I’m so glad that you and everyone else at the party enjoyed it!! I made this with cashews and it was SO SO SO GOOD!!! I like to limit the amount of lecithin I eat so was thinking of trying this recipe with macadamia nuts. Do you think that would be successful? Thank you so much for trying this, Rebecca! I think it might work with macadamia nuts!